The goal of this semester's bachelor project (master students welcome) is to build a self-replicating 3D printer. That is, build a printer that is capable of printing the parts for more 3D printers...We are going to build a Rostock-style printer, because they have a simple geometry and can be scaled up easily. Eventually, we'd like to build larger versions of this capable of printing car parts, furniture, and other real-world objects. 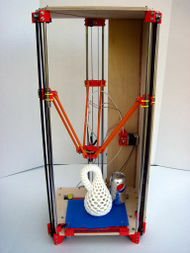 Here is a video showing the 3D printer we want to build; it's a Rostock Max. They have a nice and symmetrical design and can be scaled up to much larger printing volumes easily than other systems. 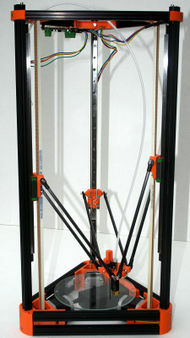 We will be basing our work on the Rostock-series of printers, described at RepRap.